Is the Maldives the best snorkelling in the world? The top ten areas regularly includes the Maldives along with the likes of the Red Sea, the Great Barrier Reef, Cayman Islands, Indonesia. But what would be the criteria for the best snorkelling and which areas would prevail? I am surprised how little the topic is discussed in online forums and magazine articles. When it has been reviewed, the treatments seem shallower than a coral cropping at low tide. For example, Costal Living did the piece ’10 top spots to snorkel’ but only covered North America in its selections. This Forbes piece ‘World’s Top Snorkeling Spots’ is one of the best lists I have seen, but there is little accompanying text and the entire Indian Ocean is conspicously absent. The Island magazine piece on ‘World 23 Best Islands for Snorkeling’ is the most comprehensive and includes the Maldives, but its singling out Veligandu would be hotly debated by many (my own research seems to point more to Kandoludhoo). While Maldives is renowned for romance (top honeymoon spot) and diving, I think it really makes a strong case for being one of the top snorkelling destinations in the world. The atoll topography is just right for ideal snorkelling and ‘house reef’ conditions. Most ‘house reefs’ offer a stunning snorkel experience just meters from your beach villa (unlike the Great Barrier Reef which usually requires a boat ride). The waters are warm (unlike the Red Seas which requires a wet suit to be comfortable). I am more of a Maldives expert than a worldwide snorkelling expert, but most of the divers and divemasters that I meet in the Maldives who have themselves snorkelled around the world, tend to concur with my bold conjecture. Certainly, it warrants a place on anyone’s top 10. Furthermore evidence that the Maldives is the best in the world for snorkeling is a recent poll by Scuba Diving magazine for the top dive sites in the world and the Maldives topped the list for 'Snorkeling' – http://www.scubadiving.com/…/2011-top-100-readers-choice-results. There is snorkeling and then there is shore snorkeling. Few publications make the distinction. Just as in shore diving, Maldives plethora of islands with nearby walls and drop-offs makes for fantastic shore snorkeling. I believe it is hard to find a good shore-side, deep drop-off, with gentle currents, in warm water, with great sea-life. Outside of the Maldives, that is. There aren’t many 3-star hotels in the Maldives, but a couple that have very good reefs are Biyadhoo and Bathala. Bruce, we are going to introduce our small kids to a good house reef in the maldives, using an airbnb house to stay in (there seem to be quite a few of those scattered around). But we have a problem – we have no idea which house reefs are good for snorkelling, and that can make quite a difference as I am sure you appreciate. So, do you have a list of house reefs that do not belong to private resorts I wonder? Because its very hard to find this out otherwise. Have a number of other friends who are interested in this matter as well on Facebook. Thank you in advance for your time and experience. If you have your lodging, then the key to great snorkeling will be proximity. There are great reefs all over the Maldives. They all have different characteristics. Some will be shallow, others quite deep drop offs. Some will have a variety of fish and corals. Others might be less impressive overall, but have some great thing to see (like mantas visiting a cleaning station or other resident creatures). 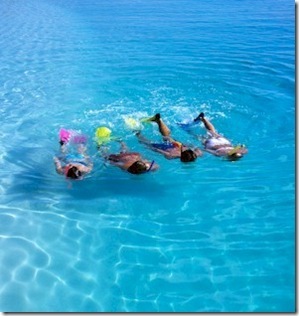 The best thing to do is to find the nearest dive centre or water sports centre near your lodging. They will being organising regular snorkel excursions (“snorkl safaris”). Obviously, they will go to the ones that are the nicest within a reasonable boat trip from your island. They can describe the various destination options and you can decide based on your swimming abilities, special interests, etc. If some aspects of a distant reef intrigue you and you don’t mind a long time on a boat, they might even take you quite far a field to see something you want.